Refrigerator often takes a big space in the kitchen and sometimes just standing in the wrong place. 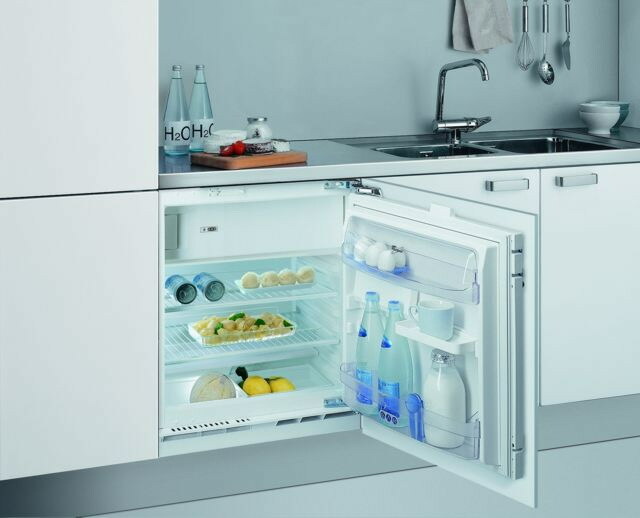 Built-in refrigerators partly help to solve the aforesaid problem, but if it is a purchase you cannot afford, you have the opportunity to embed a regular refrigerator. - adhesive tape (paint or Wallpaper), tape measure and a pencil. Determine the location for installation of the refrigerator. Usually, it's a niche between other functional parts of the kitchen. The fridge needs to look organic and its future location will be determined by the total visual embodiment of the interior of your kitchen. Measure the exact dimensions of your refrigerator, and then make space for boxes. Start collecting box. The bottom is better to make the iron, it will protect the equipment from overheating and burning out further. Box can to make pleasure comfortable material, the main hitch lies in the fact that it was combined with the other parts of the headset. You can use Wallpaper or self-adhesive film, the ornament of which is almost identical to the surrounding the refrigerator environment. Drill in the box all required openings for electric wires. Eye measure, not whether the box prevent you to open and close the doors of the refrigerator and freezer. After the box is assembled, you should go to this procedure as the installation of embedded refrigerator which is actually normal. A refrigerator needs to stand up straight and tight. The openings you can seal the rubber gasket. Alone set this fridge is practically impossible. So call assistants. Make sure in advance. Built-in appliances in the kitchen is not only functional but also very stylish solution. Make an ordinary refrigerator, you personally changed in embedded, integral part of the interior. Use decorative elements and accessories.